Azerbaijan is leading among the countries of the Commonwealth of Independent States (CIS) in terms of foreign investment per capita, Administration Chief of Azerbaijan's Economy and Industry Ministry Samir Veliyev said at a meeting of the Azerbaijani-German High Level Working Group on Trade and Investment on September 30. Addressing the meeting, Veliyev noted the successful development of relations between Azerbaijan and Germany. He said negotiations on financial and technical cooperation are held regularly between the two countries. He went on saying that joint projects in the field of trade and investment highlights the fruitful cooperation between the two sides. "Today, 177 German companies are operating in Azerbaijan. They participate in ongoing projects in our country as contractors, and the total amount of German investment made in Azerbaijan's economy is approximately $760 million. Over the past years, a positive dynamics is also observed in the trade between the two countries,"
As of 2013, the trade turnover between Azerbaijan and Germany increased by 25 percent reaching $2.2 billion, while in January-July 2014, the trade relations between the two countries increased by 15 percent. Veliyev went on to note that Azerbaijan has created all conditions for maintaining macroeconomic stability, sustainable economic development and ensuring a favorable investment and business environment. "Investment worth over $174 billion was made in Azerbaijan's economy during the period of independence, and half of this amount accounted for the foreign countries," he added. Veliyev also said Azerbaijan has become an exporter of capital. Over the last 10 years, the country's GDP increased by 3.2 times, investment making by 6.5 times, and foreign trade turnover by 6.6 times. For his part, head of the German delegation, Federal Vice Minister of Economy and Technology Karl-Ernst Brauner expressed confidence that the issues discussed at the meeting, will have an effective influence on the development of trade and economic relations between the two countries. The sides also discussed the current state of economic and trade relations between Azerbaijan and Germany, cooperation in investment, energy efficiency and renewable energy, protection of environment, implementation of twinning projects, the possibility of participation of German companies in the industrial parks of Azerbaijan, training of Azerbaijani doctors in German hospitals, and came to an agreement on several issues. Diplomatic relations between Azerbaijan and Germany were established in February 1992. The economic relations between the two countries are developing successfully. 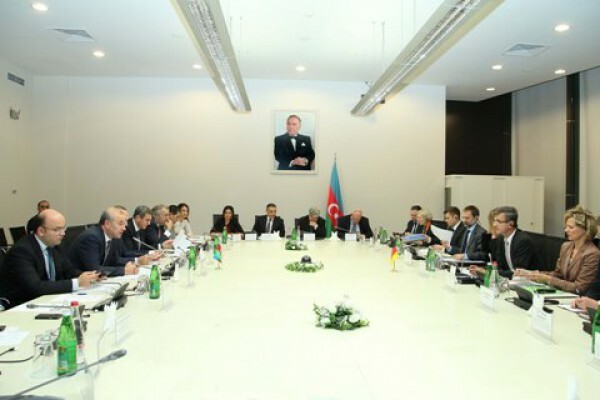 To date, 67 documents have been signed between Azerbaijan and Germany in various fields. Azerbaijan has sent about 200 entrepreneurs and young managers to various German cities in 2009-2014 to take training courses within a joint program to upgrade their skills in business management.